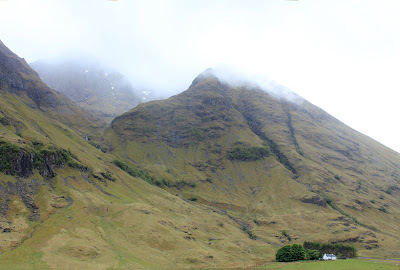 Unsurprisingly Glencoe, (Gleann Comhan), the alleged meaning of which is 'The Valley of the Dogs' or 'The Glen of Weeping', perhaps more the former than the latter, (named after the river Coe, Ossian's 'Dark Cona') is shrouded in legends like the swirling mists that veil the majestic peaks. It's magnificent scenery that seems to express so much history, is always awe-inspiring. According to the local poet John Cameron (1822-1898) Glencoe was the birthplace of Ossian. The River Coe (Cona) runs through the glen overlooked by mount Malmor on the southern side whilst Dun-Fionn, 'the hill of Fingal' rises on the northern side. Ossian's Cave, a high narrow cavern, can be seen on the face of Aonach Dubh, one of mountains known as 'The Three Sisters'. Since the shameful massacre, the glen's reputation of being haunted should come as no surprise. Even in our day and age people continue to claim to have seen the ghosts of the Maclain MacDonalds, restless spectres unable find peace since their unforgettably cruel, and treacherous massacre. A crime for which the vindictive perpetrator, John Dalrymple, was never punished. On the contrary, he was later even given the title of the Earl of Stair. Just before dawn, on a 13th of February, the anniversary date of the massacre, it's said that one can feel the presence of the victims' spirits. People have caught sight of shrouded clansmen gradually vanishing into the hillsides or sheer rock faces. Some even claim to have heard the eery screams and distant cries of the poor victims, including those who died of exposure in the snow covered hills as they tried to escape. Another legend recounts how, after the treacherous deed was done, many government soldiers intent on returning to Fort William were led astray by a host of pipers. And naturally the mournful skirl of the pipes can still be heard echoing in the glen today. One only needs to gaze across the glen and up into the misty hills to hear those wailing bag pipes. The imagined distant echo seems just as real, and one shudders as though momentarily yet profoundly immersed in this tragic history. Glencoe should never be a welcoming valley for a Campbell. Much earlier myths claim that Fingal, (Fionn McCumhail) the legendary giant and defeater of the Vikings, lived in Glencoe. Gaelic history was said to be recorded by Fingal's alleged son Ossian. But sadly, after being translated by the poet historian James MacPherson in the 18th century, the originals were written off as being unauthentic. 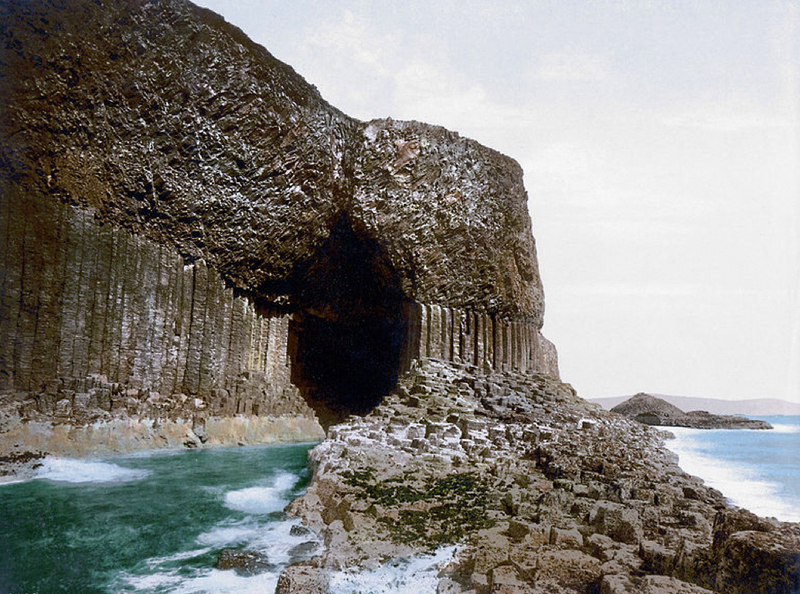 The giant Fingal is of course associated with spectacular 'Fingal's cave,' so named after MacPherson's epic poem. The cave or sea tunnel can be seen on the southern edge of the island of Staffa. Its Gaelic name, as well as Stafa, is 'An Uaimh Bhinn' which means 'the melodious cave,' due to its arched ceiling formed by nature. Like a cathedral, it produces eerie, resounding echoes. 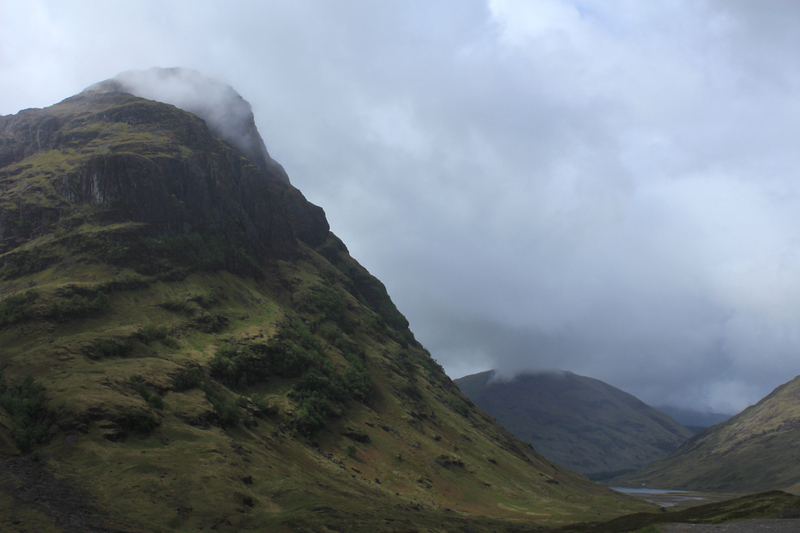 But to return to Glencoe, with giant strides, perhaps finally descending the Devils Staircase. There are witches and fairies there too, of course. There is Bean Nighe, a sort of washer woman who is for ever washing clothes- perhaps garments stained with blood- in the River Coe. It's said that anyone who sees her is doomed to die. But in spite of the risk of catching sight of Bean Nighe, (yet another Bean°) Glencoe is very special. An unforgettable valley well worth visiting. °Apparently 'Bean' is a Pictish-Scottish name derived from the Gaelic Beathen or Betha, meaning 'life' (obviously unappropriately so regarding Bean Nighe and Sawney Bean). Bean was also a Saint in the Breviary of Aberdeen. Text (various sources) and photos (Glencoe) © Mirino.